Development of erythrocytes involves coordinated changes in the nucleus and the cytoplasm of erythroid processors (see Morphology of Erythroid Precursors) . The proerythroblast is a large cell with a fine chromatin, the earliest forms not being different from other blasts. As the cell matures the chromatin becomes more clumped and the nucleus reduces in size and the cytoplasm becomes acidophilic. Finally a dark pyknotic nucleus is extruded from the orthchromatophilic normoblast to give a reticulocyte. 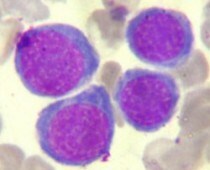 A group of basophilic normoblast are shown above. The cytoplasm is basophilic and the chromatin more clumped than a proerythroblast. The two cells on the right are less mature than the two on the left. The figure above show a group of orthochromatophilic normoblasts. The cells of the left are more mature. The nucleus is reduced to a dense body in the more mature forms. The cytoplasm still has a blue tinge. which contrasts from the megaloblasts shown below. The figure above shows three stages of erythroid maturation. The cell on the top right is a basophilic normoblast, bottom right is a polychromatophilic normoblast and the bottom left is an orthochromatophlic normoblast. Note the evolution of nuclear and cytoplasmic changes. The figure above shows a group of megaloblasts. 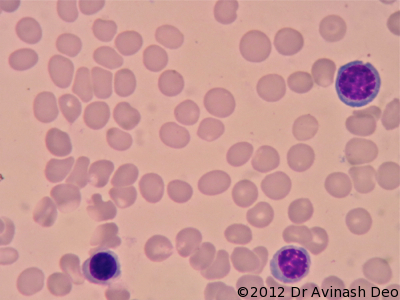 Cells in the right lower corner have a cytoplasm which is fully haemoglobinized and resembles the mature erythrocyte. These cell still have a nucleus. The cell on the left upper corner has a cytoplasm resembling a orthochromatophilc normoblast (see figure 2 and 3) but nuclear features resembling a basophilic normoblast (figures 1 and 2). Megaloblastic anaemia results from conditions that hamper DNA synthesis (B12 deficiency, folate deficiency, Chemotherapy drugs). The nucleus of a megaloblast thus matures slower than the cytoplasm resulting in cells having a nuclear morphology resembling a previous stage. 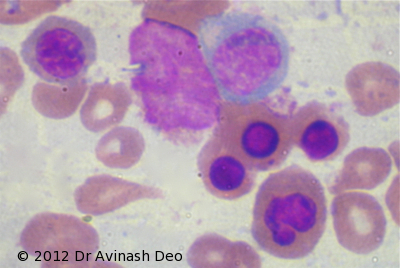 This, known as nucleo-cytoplasmic dissociation, is the characteristic feature of megaloblastic anaemia. A typo! Thanks for pointing out. Have made the corrections.